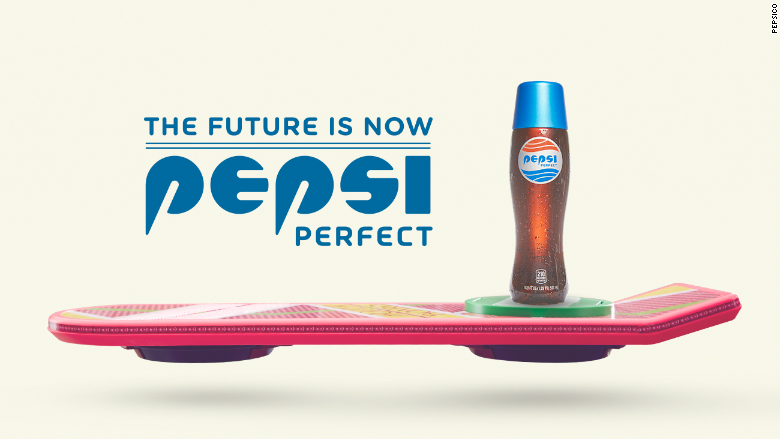 Marty McFly's carbonated future is here. PepsiCo will be releasing "Pepsi Perfect," the same soda that time traveler Marty McFly drinks in "Back to the Future Part II," the company announced on Monday. Each of those bottles will come in the same 16.9 ounce bottle that Michael J. Fox's McFly orders at Hill Valley's futuristic "Café 80's." The cost of the collectible "Pepsi Perfect" is $20.15. But there will be giveaways of the bottle during Comic Con, including the first 200 people to show up at the Pepsi Perfect booth each morning dressed as McFly. As for the taste of the cola, "Pepsi Perfect" may be from the future, but its ingredients will be traditional Pepsi. "Pepsi fans asked and we heard them loud and clear," Lou Arbetter, senior director of marketing at PepsiCo said in a statement. "The 'Back to the Future' trilogy was as big a moment in pop culture history then as it is now, 30 years later." The cola company also released an ad campaign for the cola on Monday along with a special hashtag, "#TheFutureisNow." Pepsi will have a booth at New York's Comic Con this week that will recreate the cafe that McFly visits and will include the car that acts as McFly's time machine, a DeLorean. Pepsi is just one of many brands that are somewhat making the sci-fi film's future a reality.